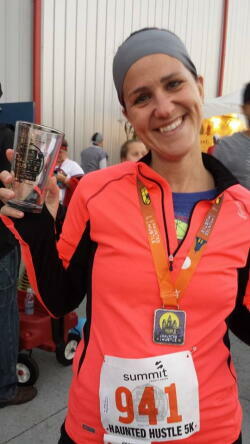 Home › About › Our Fleet Feet Blog › Runner Profile: Teri N.
Hello I am Teri a working mom of two young girls from Deerfield, WI. My running journey started about 3 years ago with the Couch to 5k plan. I needed something to motivate me back into shape after having kids. Something that I thought would be manageable and easy. WOW was I wrong! It was hard but I stuck with it and was encouraged to sign up for a 5K race. This is my second year of FOO training. Last year I completed the 10K training and had a blast. Bigger goals are on my radar this year with taking on the half marathon training which will prepare me for 13.1 and RAGNAR in June. Can’t wait! The best part is I have 4 great friends by my side doing FOO training this year who have similar goals. It’s going to be #awesome! I am excited for crushing some goals, having my friends experience it too and meeting some new ones through FOO.the gratification of finishing……I was hooked on that feeling!